Meets: 3pm, every Monday of the month in the car park to the West of the lighthouse in Torre del Mar. If you’d like to take part in this enjoyable game (Spain’s answer to bowls) come along and learn or improve your skills. 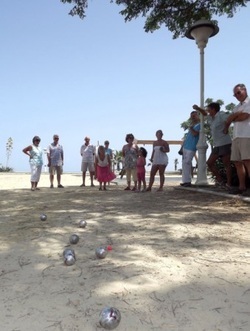 Our Pétanque (Petanca in Spanish) Group is a great success. Many of the members had not played before joining and now hate to miss a week. Our aim is to enjoy ourselves while learning the rules and techniques as well. Play starts at 3pm every Monday (weather permitting) except for the summer months of July and August. We meet in the big car park to the west of the lighthouse in Torre del Mar and close the session before 5pm in a nearby café.